With the introduction of new technology into our construction industry, it is interesting to see the way the industry is changing particularly in regards to surveying and scanning. Matt Payne, is the Engineering Manager at PJM Engineering Services and will be speaking at this year’s BILT ANZ with his session “Engineering Success with Leica Geosystems Digital Workflows” – a session we’re keen to see with the technological advancements in this field jumping significantly in the last 5 years. We sat down and spoke to Matt as well as expert in the field, Gregg Franz, the Reality Capture Segment Manager ANZ for Leica Geosystems. Matt: Typical of most contractors, I wear many hats whilst at work and managing various projects and departments as well as the occasional spot fire. My primary role is the management of design, engineering and commissioning within the business. Day to day, this can involve running a co-ordination meeting utilizing a combined services Navisworks model, training our design team how to scan existing site conditions, resolve complex mechanical system issues during the commissioning phase of a project or simply meet with clients to discuss current and upcoming projects. Aside from work – I like to take a break by swimming, running, riding or working on my house renovations. What’s interesting to you outside of your work? Matt: Outside of work I am often kept busy training for my next triathlon or working on my house. What do you feel is most lacking in our industry currently? And how do you think this can be changed? Matt: Within the AEC industry, there are several areas that can be improved – areas that tend to be often out of our control. Early project engagement is a topic that I am an advocate for, particularly for mechanical contractors. Typically, as mechanical contractors, we are the lead coordinator and often engaged too late into the project to influence design or provide input on buildability and spatial restraints. This late engagement is often governed by the need for clients to have contractors commit to their best and final offer. What are some issues that your customers face and how has Leica managed to help overcome these issues? 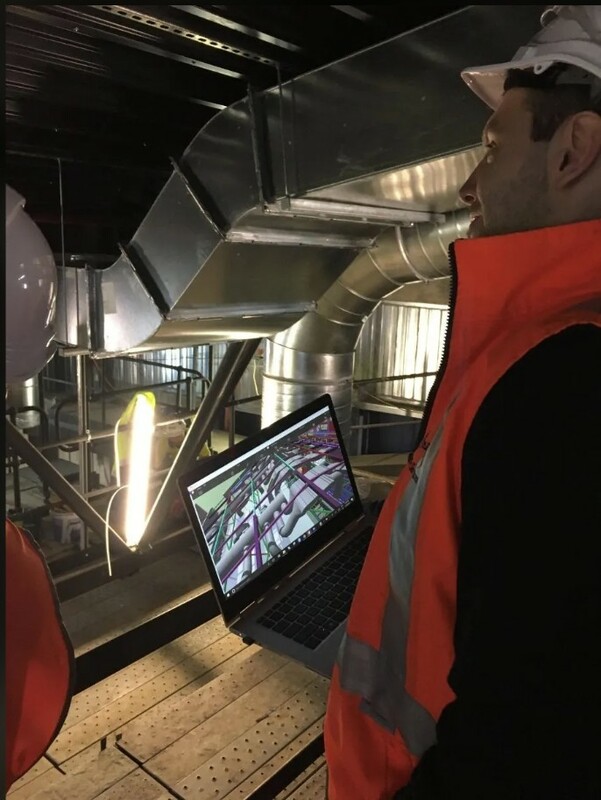 Matt: One of the most crucial steps that we spend a significant amount of time on within the design office for our customers, is coordinating ceiling services including; ductwork, pipework, electrical cable tray, fire pipe and hydraulics pipe. This is crucial to ensure once on site, the installation can be sequenced efficiently, and minimal reworks are required. To aid this process an invaluable resource within the company is our Leica BLK360, a large part of our projects involved existing infrastructure, and this is where the BLK360 imaging laser scanner is a perfect fit, enabling existing site detail to be obtained to an accuracy of 6mm. Tell us a little about your session – what was the motivation behind it and why should delegates attend? Who are you hoping to reach with your sessions and why these people in particular? What are you hoping delegates will gain from attending your sessions? Matt: My session is a summary of the current construction industries digital environment from a contractor perspective. There are many parties that are involved within every project from initial conception to hand over and over the years we’ve found a range of digital efficiencies that can be applied throughout these phases to assist both PJM and our clients. The session is targeted towards anyone within the AEC industry from clients, engineering consultants to sub-contractors. We’ll discuss the project initiation and tools used here right the way through to construction, prefabrication and commissioning, all of which have their own tools/software that assist in the process. Do you see differences between Australia and North American or European markets in how technology is being used to help deliver projects? Gregg: There are similarities between all 3 regions in terms of adopting technology and the way it is implemented. What we commonly see in Australia is that organisations like PJM Engineering are still waiting for the optimal time to implement change. Photogrammetry has really helped make point clouds more useful, what’s the next big development in the point cloud technologies? Gregg: I’m not expecting just one big development, I think we will see more of many incremental advancements in various areas such as; feature extraction and speed in transferring data and many more. I believe we will see improvements in how we integrate various point cloud technologies to facilitate seamless workflows and allow easier collaboration for end users. Tell us a bit about your robots? What kinds of tasks are they undertaking, and do they operate independently or is an operator still required? Will we see robots and drones in the near-term future replacing surveyors? Gregg: I don’t think we will see a replacement of surveyors anytime soon, we may see robots being used in conjunction with surveyors to assist with improving productivity. For example, 5 robots being used for marking out points on the floor and while all 5 robots are being controlled by a surveyor. Make sure you don’t miss out on this session! Register Now!